Το τμήμα marketing της Volkswagen ονόμασε την τεχνολογία αυτή “Low-E” και παρότι δεν μπορεί να εγγυηθεί εντελώς την μη δημιουργία θολώματος και πάγου, μειώνει όμως σε μεγάλο βαθμό της πιθανότητας σχηματισμού. Το πότε θα τοποθετηθεί σε αυτοκίνητο παραγωγής δεν είναι σίγουρο αφού οι επιστήμονες πρέπει να λύσουν ακόμη ένα πρόβλημα. Ποιο πρόβλημα; Το οξείδιο του Ινδίου – Κασσσίτερου προκαλεί παρεμβολές στα ραδιοφωνικά και κινητής τηλεφωνίας σήματα. Wolfsburg, 05 November 2010 – Ice-free windows: Despite frosty temperatures, many car drivers will soon be spared the unpleasant job of ice scraping. That is because Volkswagen and Audi researchers are introducing the first anti-fogging and anti-icing car windscreen, which they developed together with the Fraunhofer Institute for Surface Technology (IST) in Braunschweig. Unlike heated windows, the new windows are based on a physical principle that does not allow an ice layer to form in the first place – even at temperatures as low as minus 18 C. The secret of the innovation lies in a wafer-thin transparent coating of indium tin oxide that is applied to the window. “We call this a ‘Low-E’ (low thermal emissivity) coating. Applied to the outer glazing, it prevents heat from radiating skyward. We are proud of this innovation and will promote it throughout the Group. That is because an ice-free window is an added convenience to our customers,” explains Thomas Drescher of Volkswagen Development. The conductive “Low-E coating” protects the glass from cooling, so that water on the outer surface does not condense or freeze. 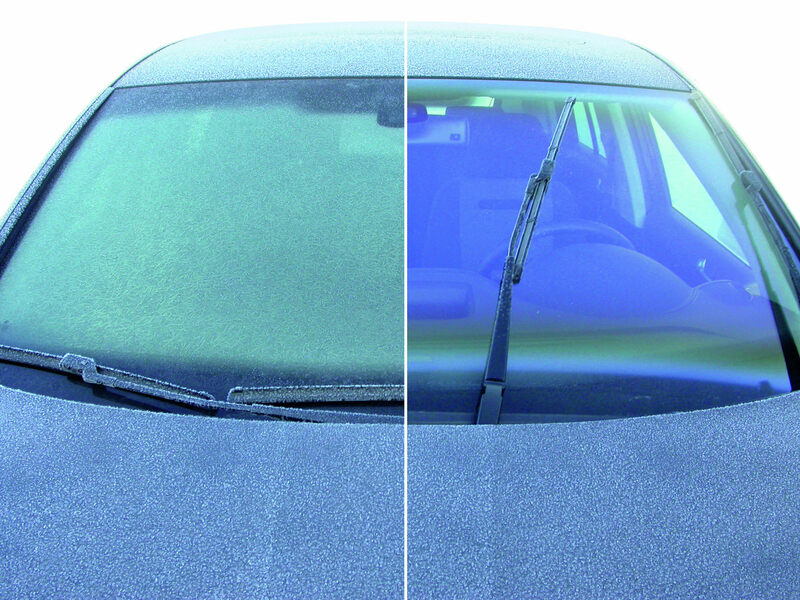 No ice film is formed, because radiative heat loss to the cold sky is minimised, and this prevents or delays cooling of the glass surface to below the dew point. Of course, weather conditions such as cloudiness, relative humidity and wind also play a significant role here and affect the windows’ condensation behaviour. “The ‘Low-E coating’ cannot prevent ice formation or condensation entirely, but it can significantly reduce the likelihood of it happening,” continues Drescher. One issue in the current development stage is that the new coating limits radio traffic in the automobile; this can impair radio and mobile phone reception. Drescher: “It will take some time before the ice-free car windscreen is market-ready, but we are working intensively toward this goal. The bottom line is that for the Volkswagen Group, the ice-free window represents a successful innovation that is unique worldwide.” For customers who do not care to wait for this technology, Volkswagen alread offers auxiliary heating units and heated front windscreens in today’s vehicles.